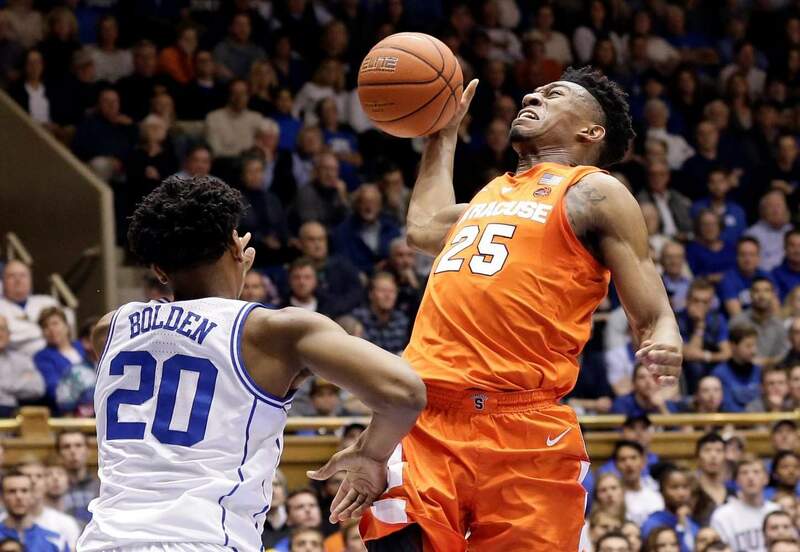 Duke’s Javin DeLaurier guards Syracuse’s Tyus Battle during the first half of Monday’s game in Durham, N.C.
Syracuse players celebrate as time expires during overtime in Monday’s game against Duke in Durham, N.C. Syracuse won 95-91. 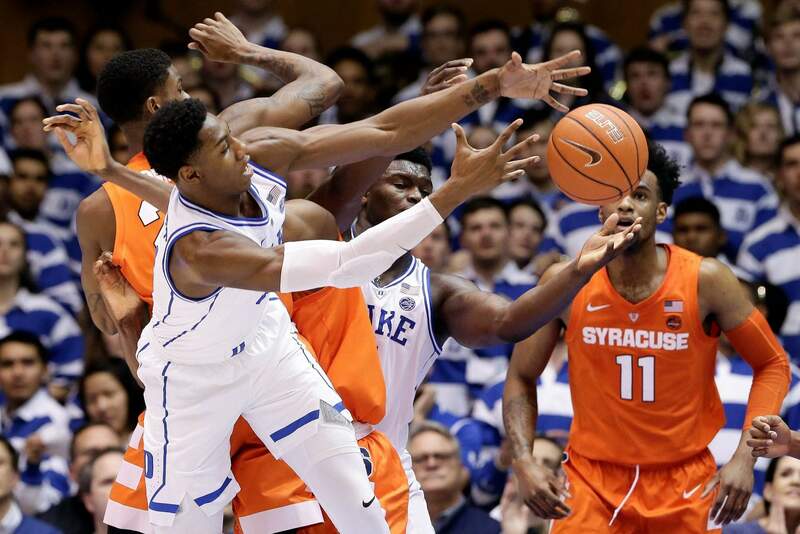 Duke’s RJ Barrett and Zion Williamson, rear, reach for a rebound with Syracuse’s Oshae Brissett and Frank Howard during the first half of Monday’s game in Durham, N.C.
Duke’s Marques Bolden defends while Syracuse’s Tyus Battle drives to the basket during the first half of Monday’s game in Durham, N.C.
With Reddish out with an illness and Jones suffering a shoulder injury roughly 5½ minutes in that coach Mike Krzyzewski said will keep him “out for a while,” the Blue Devils were down two starters and became a completely different team. Zion Williamson had a career-high 35 points and 10 rebounds while playing two days after he was poked in the eye at Florida State. His free throw with 16.2 seconds left in regulation tied it at 85 for Duke (14-2, 3-1), but he missed a second go-ahead foul shot. Brissett grabbed the rebound for Syracuse, but Battle’s 3-pointer before the buzzer bounced off the back iron. BIG PICTURESyracuse: The Orange looked nothing like the group that shot a season-worst 31.6 percent in a home loss to Georgia Tech two nights earlier, and they felt slighted by oddsmakers who had them as 17-point underdogs. Battle said Boeheim mentioned it to them before the game. Duke: The night took an ominous early turn for the Blue Devils, when Jones injured his right shoulder before the first TV timeout. Jones’ injury has the potential to be catastrophic for Duke, with Jones tops in the ACC in assist-to-turnover ratio while also serving as an elite on-the-ball defender on a team that entered ranked third in Division I in Ken Pomeroy’s defensive efficiency rankings. SHOT OF THE NIGHTThe game might not have made it to overtime had the Orange not hit an 80-footer at the halftime buzzer. They got the ball back with 2.7 seconds left after Duke couldn’t get a shot off. Hughes took the inbounds pass and initially dropped it before taking three dribbles and flinging it from three-quarter court. It swished through to pull the Orange within 49-48 at the break. 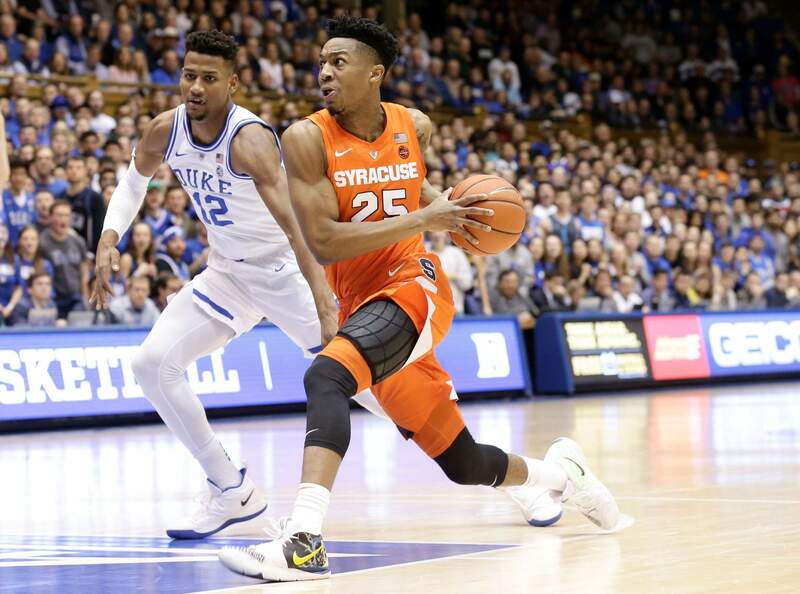 KEY STATSyracuse outscored Duke 89-77 after Jones was injured while shooting 45 percent in his absence. Jones had four steals when he was injured at the 14:23 mark of the first half. The rest of the Blue Devils combined for four steals for the entire game. UP NEXTSyracuse: Hosts Pittsburgh on Saturday.